Robin Stanley Taylor | The life and times of an undergraduate. This is the right room, isn’t it? For the final time in this academic year, course representatives for all years in mathematics convened to discuss grievances with the faculty. I arrived early and spent several minutes moving the tables and chairs to befit a conference rather than a class. As is usual, we had little business to discuss and the meeting adjourned after barely one third of the allotted time. The most prominent talking point was the positioning of our examinations, both spatially and temporally. Students were not happy at the prospect of using the Allam Medical Building, where they would have to balance their pencil cases, question sheets, answer booklets and identity cards on one tiny folding table. Some were also anxious that multiple tests would be placed within the same week, giving little breathing time in between. We had the usual round of gripes about certain lecturers. A consensus emerged that students wanted their course leaders to be more consistent about putting lecture notes and assignments on Canvas. I inquired as to the outcome of the faculty reorganization, and was told that essentially the old departments had reformed, so that much of the outdated signage is now in fashion again and the schools system to which my cohort were introduced in 2017 will likely be seen as a minor blip in years to come. With the conversation fizzling out I was left to put the furniture back in its normal arrangement. I have not yet decided whether to run for this position again in the next academic year, nor even if it will still exist under the same name, so today’s forum could prove to be conclusion of this series. Last week I and many other students received notice that The Lawns, that leafy undergraduate hamlet in the large village of Cottingham, would cease to offer accommodation in the next academic year. At some point I ought probably to make a post discussing this issue in more detail, but for now what piques my interest is the article which appeared in The Tab three days ago. The third photograph is of the balcony on the upper floor of the Lawns Centre, which I took in October 2017, about a month after moving into Ferens Hall, and subsequently uploaded to Wikimedia Commons. This got me wondering where else my images may have turned up. Snooping around, I found this blog post by Beyond Nuclear International, which laments the recent death of Paul Flynn MP. Nearly two years ago I attempted to make a Wikipedia article listing all current members of the House of Commons in order of seniority. I eventually abandoned the project when I discovered that such a page existed already. Unlike the article just referenced, mine would have included the free-licence portraits of those members which had recently been published. The late Mr Flynn was not included in the new gallery, nor did there appear to be any other photographs of him that were available under the terms necessary for Wikipedia. After searching fruitlessly for a few days, I decided to fill the empty table cell with a cartoon image which I constructed using the shape tools on Libre Office. The fabricated portrait was never used on any real articles, so I rather expected it to languish in permanent obscurity. The use of my crude caricature on BNI’s sombre blog post is especially perplexing given that the page already features two photographs of the departed, the first a publicity shot courtesy of the CND and the second a screencap of parliamentary footage dubiously credited to Flickr-ite Ninian Reid. Curiously there are to be found at least two photographs for which I am credited even though I did not take them: an editorial in The Oxford Student and a newsletter by the Shropshire Patients Group. In both cases the images were screenshots from short educational films which were released on the UK Parliament YouTube Channel in late 2012. In these cases it seems most likely that the creators of these articles found me listed on the file pages as the user who uploaded the images, and mistook that to mean that I had been the one who took those photographs in the first place. One dreads to consider what this says about the reading comprehension skills of the people of the people who produce these websites, and can only hope that the rest of their content is more carefully considered! Actually, that looks more like paper to me. Today I attended another forum for the course representatives, for which the key topics were Canvas, the library, and access to constituents. Michelle Anderson, the university librarian, was our guest speaker. The gimmick of her presentation, this being near St Valentine’s Day, was that attendees were asked to write love letters to the library extolling its virtues, or alternatively breakup letters articulating its shortcomings. Generally the negative sentiments focused on the building environment, with calls for water fountains, toilets and lifts to be cleaned more frequently as well as for more furniture to be more ergonomic. There were several calls for more quiet study spaces, though the frustration here seemed to be aimed more at other students than at the facility’s administration. 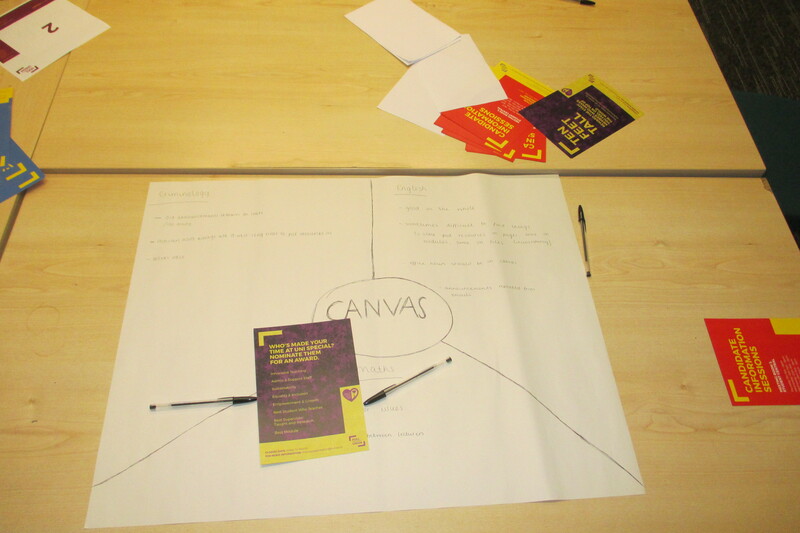 On the topic of Canvas, we were put in small groups and made to produce mindmaps of our likes and dislikes. Several delegates expressed a desire for the teachers within a faculty – or perhaps the whole university – to be more consistent in their use of the system. Currently there are some lecturers who put all their files and assignments online whereas others have left their pages practically empty. There were also complaints of the sidebars being cluttered with trivial messages for weeks on end. Turning to the issue of representation, I found that I had little to contribute as my own coursemates have very rarely contacted me directly over issues that relate to my portfolio, so I have not been required to pursue any particularly onerous campaigns on their behalf. Overall this meeting proved fairly unremarkable. There was, of course, plenty of cake. This time of year, after the end of winter examinations but before the beginning of a new trimester, is rather uneventful as far as undergraduates are concerned. I therefore have the opportunity to leave my student dwellings and go home for a week. Today my parents took me on a tour of some interesting locations in the sparsely-populated parishes of South East Holderness. I had seen many of these locations before when delivering leaflets for the Hubb, but this excursion was focusing more on the historical perspective. Our first landmark was the Gunpowder Plot sculpture, erected in 2013 in Welwick. The sculpture depicts conspirators Guy Fawkes, Robert Caseby, Jack Wright and Kit Wright – the latter two being brothers from this village. The work was unveiled by Graham Stuart MP, whom the plaque incorrectly styles as a privy council member. Taking up the bulk of our day was the Church of St Helen, in the parishes of Skeffling (civil) and Easington (ecclesiastical). Constructed in the early reign of King Edward IV, it held regular congregations until last summer when, after several years of dwindling audiences, the Church Commissioners decided to close it down. Inside everything looks much as one would expect: stone arches, wooden pews, and haunting streams of sunlight through the stained-glass windows (this building has no electricity, though it does have candles and what looked like gas lamps.). Though nothing was obviously missing, one could sense from the thin layer of dust on so many surfaces and the abrupt skipping of years in the guestbook that this was no longer the centre of any significant activity. The church contained a few references to the aforementioned Wright brothers, but what most interested us, given our association with the Tower, were the many monuments to the Holme family, both verbal and heraldic. The bodies of John Holme, Esq (d. 1744) and his wife Dinah, née Burgh (d. 1729) are contained here, along with those of two sons (Henry & John, the latter being rector of Brands-Burton & Barmston) and a daughter (Margaret, Mrs Thomas Reaston). Above these large luxurious engravings are several depictions, in varying states of repair, of the Holme escutcheon – Barry of six Or and Azure, on a canton Argent a chaplet gules. The most prominent of these is topped by the Holme crest – Out of a mural coronet Gules a hound’s head erased Or – and impaled with the arms of Burgh – Argent on a saltire Sable five swans Proper. There were many more references among the many dusty documents to the Holmes of various generations, though the task of constructing a coherent timeline is confounded by the fact that, like so many families prior to the nineteenth century, they frequently recycled the same limited pool of names and were not much concerned with consistent spelling. Having left the church, we went in search of the sound mirror at Kilnsea. Constructed around much of the north east coat during the First World War, these large concrete hemispheres would focus the engine noise from approaching aircraft, so that advance warning could be given of imminent bombing raids. The mirrors were ultimately rendered obsolete by the invention of faster aeroplanes and later RADAR. We did not make it to the mirror, however, because the intermediate terrain was not navigable. Much of the surrounding land has been given over to a nature reserve managed by the Yorkshire Wildlife Trust. To approach our target we had to troop over a lot of damp, thorny ground and long grass. Then there was the problem of the artificial lake. I walked along the full length of the narrow strait depicted above, but it did not quite reach the bank at the other side, and I judged the water to be a little over what I could reasonably ford – both in width and in depth. None of us wanted to risk spending the next few hours trudging about with mud-soaked legs and squelching boot-soles, so we gave up and turned back. Our final stop, for a rather belated lunch, was at Spurn Discovery Centre. Opened ten months ago, this rather controversial building is the headquarters of the Spurn National Nature Reserve. My family have visited Spurn many times during my life, and on each occasion found it to be a slightly different shape. Coastal erosion here is very fast, due to the soft nature of the boulder clay, and the entire landmass moves two metres westwards every year. Nearly two years ago a major storm wiped out part of the road to the head, creating a tidal island. Some months earlier the trust abandoned attempts to preserve shoreline, instead planning to “let nature take its course”. Tourists are driven across the peninsula using a “Unimog” bought from the Dutch Army, but even that struggles to get across when it rains or the tide rises. The café had a wide selection of reference books and memorabilia, most of which related to the birds and other creatures which inhabited the surrounding sand. Ornithology – despite what my name and logo may imply – is not my area of interest or expertise, so I have little to comment on these. I was rather hoping that there would be some material relating to the human history of the region, for up until the nineteenth century there were dozens of small towns dotted along this section of the coast, all now submerged by the north sea. If nothing else, I could have hoped to find some interesting heraldry somewhere. It was through editing Wikipedia that I came to develop an interest in heraldry. Since my scientific and technical education was not yet at the point where I felt competent to edit articles about elements, reaction mechanisms or mathematical proofs. I instead concentrated on my humanities interests. This saw me editing the articles of statesmen and the offices they held. Even here, however, I was primarily devoted to the technical details rather than to the grand sweep. My edits would concern what precedence a certain politician held, the honorific by which they should be addressed and, of course, what would be on their coat of arms. A medieval system of shield markings for differentiating knights on the battlefield (or at a jousting tournament) may at first appear to have little relation to a discussion of parliamentary elections or ministerial appointment, but heraldry has long outlasted the system of warfare whence it originated, evolving to become a signature and status symbol for people of many professions. In Britain there is a significant overlap between the armigerous classes and the political community, though of course this is true to varying extents in many other countries also. In earlier times it was the case that high office in parliament, government, military and church was largely reserved for members of royal and noble families who naturally would have possessed armorial bearings. In modern times the direction of passage has reversed somewhat as formerly unadorned statesmen over the course of their careers (and particularly at their retirements), acquire heraldic achievements to reward their political ones. The upshot is that over the last couple of years I, having run the course of correcting the written details of the biographies of the great and powerful, turned to filling out the visual side of things as well. By a combination of desktop drawing tools, image manipulation and liberal use of the set transparent colour function, I have put together depictions of well over two hundred coats of arms belonging to everyone from the Duchess of Inverness to Heston Blumenthal. Sometimes the details of a person’s achievement can be frustratingly hard for a penniless amateur to uncover. Sometimes, as in the case of Philip May, press will display an image of a coat of arms but will not include the formal blazon. This means that I can only copy from the photograph to the best of my abilities rather than construct it from scratch. Other times, such as with the late Lord Martin of Springburn, the newspapers will give an informal list of the elements in the arms but will provide neither blazon nor illustration, and therefore it is not possible for me to reproduce the arms at all. In England, Wales, Northern Ireland and a few other Commonwealth realms, heraldic grants are made by the College of Arms. Their website regularly posts newsletters and articles detailing recent grants and matriculations. A reasonable smattering of these are illustrated and blazoned online, but the majority are simply listed with reference codes, requiring an inquisitive Wikipedian to expend great effort in making a personal inspection – and often pay a fee. In Scotland the same function is carried out by the Lord Lyon Court. Their website was, until late last year, laughably outdated. Even now it is not especially impressive. Similar issues are present there and, though blazons are occasionally published on Twitter, on the whole their output remains a mystery. Sometimes, the recipients of these new grants are keen to publicise them, whether on their personal websites or on social networks. On other occasions their is no such disclosure. The college’s newsletters often list, without elaboration, peers of the realm and public officeholders who, upon investigation, do not have any significant online presence beyond perhaps their entries on the websites of the organizations which employ them, none of which are prone to including such symbols. My work in this field was accelerated significantly this August when I came across Cracroft’s Peerage – a website which attempts to detail all of the peers, baronets and other prominent people in the British Isles, including their armorial possessions. The website is far from ideal; the overall design is rather old-fashioned, there are a great many missing or unfinished entries, and an inefficient system of navigation is made worse by the frequency of typing errors in hyperlinks, which make certain pages inaccessible without some ingenuity on the part of the end user. Even so, Cracroft’s has been a boon to my efforts, and I have uploaded over two hundred escutcheons in the last few months based on the information found there. For a straightforward blazon, the whole process of illustrating, uploading and embedding the arms can be completed in as little as twenty minutes. On occasion, however, the process is slowed by the requirement for more complicated designs, especially if they contain non-standard elements. Roundels, chevrons, annulets, crosses and mullets can be easily created by the shape tools available in most office software. Lions, unicorns, crowns and roses are more complex, but are sufficiently ubiquitous that scavenging them from existing images is not too onerous. Other components, such as the golden fuschias in the arms of Lady Fookes or the crossed pencil and pen in those of Lord Stansgate, proved rather more challenging. I am far from the first person to contribute to the topic of heraldry on Wikipedia. The Heraldry & Vexillology project has nearly two hundred participants. In my estimation, the most eminent of these is he who goes by the name of Sodacan. He has been active on the Commons for just over ten years and his publications number well into the thousands. If you have ever looked at a coat of arms on Wikipedia – especially if it relates to a member of a royal family or a major organ of state – it was probably made by him. His capabilities in this realm are many levels above mine, for he has constructed from scratch many hundreds of distinct heraldic elements and arranged them flawlessly in many convoluted ways. Testament to Sodacan’s mastery in this field is that his graphics have escaped from the Wikimedia world: UKTV documentaries William & Harry: Brothers In Arms and The Stuarts: A Bloody Reign both prominently featured his art in their title sequences. Were that no enough, the Windsors themselves got in on the act for the two royal weddings in 2018. Sodacan’s representations of the arms of Their Royal Highnesses Prince Henry of Wales and Princess Eugenie of York were used on the orders of service for their respective ceremonies. The Central Chancery of the Orders of Knighthood also prominently displays his picture of the Queen’s arms on their homepage. Disappointingly, none of these bother to credit him. Still, it’s nice to know that even the work of an anonymous hobbyist can make it into high places. A mere five days after hearing a lecture on Brexit, I went to hear about the other half of the present day’s news obsession – Donald Trump. The university’s alumni association runs a programme called “Inspired in Hull”, whereby former students who have risen to prominence are called back to give their life stories before their successors. So far I have attended five of these events, though unfortunately I never got around to logging them here. They were Democracy & Theatre by playwright James Graham (8th February), From Hull to Hogwarts by illustrator Olivia Lomenech Gill (9th March), From Hull to the Cosmos by philanthropist Dill Faulkes (3rd May), Breaking open the Boardroom with businesswoman Denise Wilson, and most recently this one by journalist Paul Danahar. Paul began his story with an anecdote from 15 years ago in central Baghdad, shortly after the fall of Saddam Hussein when he had to flag down an approaching American tank with nothing but a dirty hotel tablecloth. He said that he had witnessed many key historical events, including wars, revolutions and natural disasters. After being kidnapped, deported and fired upon several times, he decided that life might be quieter if he left his role in the Middle East and took up the role in Washington D. C. instead. But then, in his words “Donald Trump came down an escalator… it’s been quite busy since then.”. Mr Danahar matriculated at this university in 1985, studying physics. He was the first of his family to go to university and arrived with a narrow view of the world and his career path. He joined the university newspaper over the objections of the English students who ran it and eventually went to work for BBC Radio Humberside. He described his path from Hull to Leeds to London, through India, South Africa, Beijing and Jerusalem before finally winding up where he wanted to be. Paul described his work as the study of how decisions (and equally non-decisions) made in Washington would affect the rest of the world. He travelled through Afghanistan during the late 1990s and was in place to see the 2003 invasion of Iraq. Lately he has seen how decades of carefully lain international agreements can be casually destroyed by the upload of a few words online. The rise of social media changed the nature of political journalism, especially the Arab Spring in 2011. Dictatorship, said Paul, relies on state control of the media – the party line and the face of the dear leader must be plastered on every public surface. The internet changed this, allowing young revolutionaries to organise a decentralised campaign. The establishment’s traditional strategy of capturing or bribing the leaders failed, because there were none. This could, however, prove to be the downfall of the revolution at a later stage, for there was no clear authority figure to succeed the ousted tyrants. The opposition “thrived on the adrenaline of revolt, but quickly got bored of the tediousness of government.” This loss of passion on behalf of the masses allowed their tormentors to return, consolidate their power, and snuff out those who had once threatened them. Our alumnus lamented that it was easy to be passionate about politics while at university – when one has the time and the inclination to imagine a better world – but that the best and brightest among his audience would probably go elsewhere in search of more fulfilling lives. In his view, the statesmen of recent decades were neither best nor brightest, and rather than conspiracy or corruption most of the problems in the world today were caused by mere incompetence. Paul then gave a somewhat ominous warning to his young attendees that they should not lose their voice upon graduation, assume someone else will fix everything, convince themselves that voting does not matter, or put blind faith in those who sought power on their behalf. “Shouting into the echo chamber of Twitter might feel good, but unless you use social media to organise – not rant – you will find that others use it to war.” He noted that in recent years fascists and other authoritarians around the world had gotten to grips with the internet and were using it to destabilise civilisation. To contrast, Danahar spoke about his visit to the technologically-retarded North Korea. The capital of Pyongyang had bus queues into the hundreds and public buildings unheated through the depths of winter. As a foreign guest he was accompanied everywhere by two minders – they would monitor him as well as each other. China was a little different: there were unmarked policemen with umbrellas who would obstruct the view of news cameras. In Iraq the reporters could sometimes incapacitate their minders with a heavy meal, but in North Korea this was not possible. They will, however, do anything for whiskey. Paul briefly managed to interact with some civilian locals during a bowling tournament, but this was swiftly interrupted by a power cut. Our inspired guest went on to recall his time in Jerusalem as Chairman of the Middle East Foreign Press Association. There the media were regularly harassed by the public and by political campaign groups. Death threats and abusive comments were commonplace. In particular, Mr Danahar highlighted the different ways in which domestic and international press covered conflicts in that region – the former would show graphic violence in all its gruesome glory whereas the latter would focus on dry statistics. This difference in coverage led to a divergence of Eastern and Western perspectives, so that the former think of the latter as detached and uncaring. He also said that there was a “blame game” around the reporting of these statistics (fights over “children died” versus “children were killed”, for example) with pressure groups hoping to harass the media into silence. China went to the other extreme: In Paul’s experience, you only knew you had displeased the government when the already slow bureaucracy ground to a complete standstill and one could get no work done. If anything it was a delight to hear locals criticise your coverage, because that at least was proof that somebody could see it. Foreign press is heavily censored in China, and officials will even give out transcripts of interviews with inconvenient segments excised. He was keen to stress how hard it was to comprehend that country’s culture, even if you had some contacts and knowledge of the language. It was at this point our guest moved to the United States. He claimed many of us forget that, although their tongue is the same as ours and we consume a lot of their media, America is still a very foreign country – a fact exemplified by the accession of Donald John Trump. Danahar told us that journalism in D.C. was “like trying to drink from a fire hose” in that reporters struggle to focus on matters of true importance when bombarded by the daily torrent of scandals and controversies which emanate from the White House. Many of this administration’s high level appointments have gone to hugely unsuitable people, and there is no unified voice from the executive – the president and his underlings will regularly produce antonymous assertions in their statements and briefings to the press, the public and each other. We were treated to a case study regarding the United Nations General Assembly: Trump arrived late, then spent his speech inflating his own ego, then flatly denied the mockery he received from his foreign counterparts, insisting they laughed with him rather than at him. The pernicious part of this fiasco was that while most of the world had the true version of events reported, Trump’s domestic supporters knew only his take. Through their social media routines they filtered out the more critical evaluations. The president is able to communicate directly to his rural voter base without interference by the traditional channels, meaning that his supporters have no alternative worldview supplied to them. As a result, they believe Trump to be trustworthy and dismiss reports of his incompetence as enemy propaganda. Despite what most professional commentators would say, the president’s supporters believe him to be staying true to his campaign promises. They are correct with regard to tax cuts, immigration control, and shedding of environmental promises. They deny, or remain unaware of, the many areas on which he lied or failed. That said, our guest did not hold America’s traditional news organisations in high regard either Most of them have become firmly entrenched as agents of either the government (Fox) or the resistance (CNN). Their motivation for this is financial rather than moral, for their ratings – and consequently revenue – have shot up in the last few years as Americans have turned on each other. How one communicates with the White House has also changed. Whereas professional observers would once have spent hours speculating over Barack Obama’s inner thoughts, nowadays the general public can know Donald Trump’s convictions before his own cabinet do. Danahar singled out the particularly tragi-comical example of the Honourable Rex Tillerson, formerly Secretary of State: He did not use Twitter himself, so had an aide print out his leader’s bulletins for him to read. One of these was the announcement of his own dismissal. Paul brought up the abnormally high frequency of leaks from high office. He put it down to the lack of any unifying creed between Trump’s officials. Many of them had accepted his invitations purely for personal gain, having previously languished in political obscurity. Once in office they dedicated much time and effort to lashing out at their colleagues in a battle for predominance and presidential favour. Another source of informational incontinence is what Trump calls the “deep state”. These are lower level officials who are firmly opposed to his policies and deliberately sabotage his every move, hoping to save the United States from its own president. Danahar notes that many on the left, despite their democratic principles, seem to favour this approach: They despise the current president so much that they would permit his removal by coup. Paul’s friends in the media have accepted that this daily torrent of outrage and scandal will not subside while the current presidency lasts. To answer the inevitable question, he predicted that Trump could indeed secure a second term of office. The support among the president’s base has endured, and he has been seen to deliver on many of his campaign promises. Paul also predicted that the Democrats would still be in denial by 2020, and would pick a candidate who might have won last time around – such as Bernie Sanders – rather than one for the present. To round up his speech, Mr Danahar turned to how he had indeed been inspired by the university, city and people of Kingston-Upon-Hull. He told his student audience that though the best years of our lives remained ahead, this time would be the most transformational. University would shape us for decades in the future. There then followed the question and answer session. Again, I got the very last one and again the answer was a little off-point: In the last few years many newspapers, broadcasts and comments thereon, both in Britain and abroad, have alluded to a decline in the standards of political discourse and behaviour. This is not solely about Trump – it also relates to our withdrawal from the European Union, the rise of the Islamic State and the emergence of far right figures many formerly stable nations. I have found many people despairing at the rapid decline of democracy and discourse. Frequently their are remarks to the effect that “reality has ended” or that we have entered a new political dark age. One particularly illustrative example is The Thick of It. The series was still airing as late as October 2012 and was at the time considered the peak of cynical satire, with its unfiltered profanity and its dark, desperate atmosphere. By 2016, Armando Iannucci was already saying that it could never be renewed – real life has moved beyond parody. I wanted to know precisely when, in Paul’s mind, the cut-off point had been. When did he consider politics to have last been “normal”? My question triggered much nervous chuckling from the audience and the speaker asked sarcastically how much time he had available. He pointed to the late George Bush senior’s presidency as a time when one had opponents rather than enemies, a fact which changed during the Clinton years thanks to the work of Newt Gingrich. He was not the first to make this observations. He said that the office has never recovered from the damage of the Lewinsky scandal, even with the impeccable behaviour of Barack Obama. He said the bar nowadays is much lower than it had been in the past – where once Howard Dean had ruined his bid with one inappropriate shriek, now Trump could brag about groping women and still wind up successful (he’s not the first to make this comparison either). Paul predicted that this change in standards could lead to more people of great wealth from outside the mainstream parties to run for office on their own steam, with better but poorer candidates being forced out as a result. In particular, he said that someone like Ross Perot might have a decent chance of victory if he ran again today, for the political environment has changed to favour him. Finally, the event drew to a close. Paul was given another round of applause and handed the traditional goody bag of university merchandise. The audience withdrew from the lecture theatre to navigate home through the darkness which had fallen outside. This is the penultimate teaching week, so the semester is winding down. I am sure that there will be a further series of Inspired in Hull lectures in the new year, but that is a story for another post. I think I left the oven on. The Institute of Applied Ethics is a subdivision of the School of Histories, Languages and Cultural Research. Tonight it put on a talk by Professor Danny Dorling of St Peter’s College, Oxford. He came to show us his statistical research into the demography of the EU referendum two years ago and the history of Britain’s political consciousness. He also plugged his upcoming book Rule Britannia: Brexit and the End of Empire, written in collaboration with Professor Sally Tomlinson. The event started late, as there had been an unexpectedly large audience signing up and so the venue had been changed at late notice. 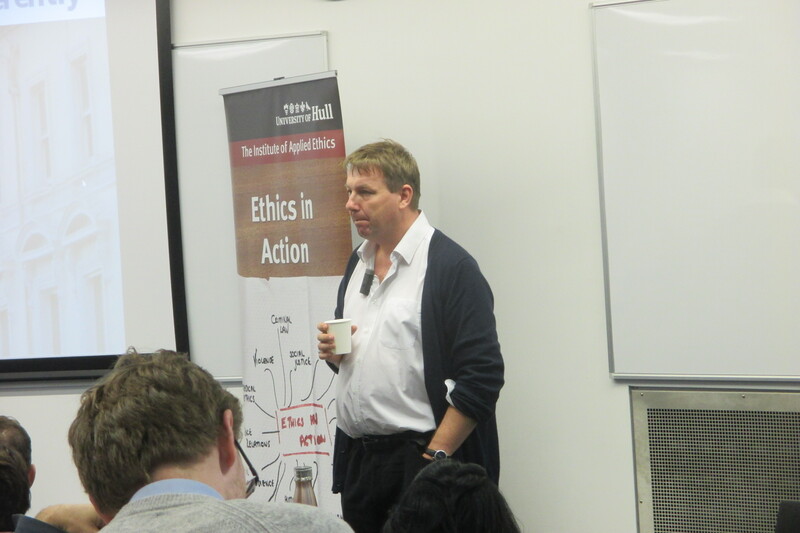 The director of the institute, Professor James Connelly, introduced Dorling as a forefront thinker on the left. From this alone one could probably guess the general theme of the presentation and indeed Dorling himself gave a similar “warning” by starting with a slideshow of graphics used in his book – many of them relating to the British Empire and immigration. Dorling attempted to counter some of the conventional wisdom which has emerged during the last few years concerning the circumstances of Britain’s withdrawal. In particular he drew our attention to a common assertion that people in deprived areas were more likely to vote Leave and those in wealthy areas to vote Remain. He said that, under statistical analysis, the correlation between deprivation and Euroscepticism was only 3%, whereas an 80% correlation could be found for obesity (not because Leave voters themselves were necessarily overweight, but because Remain-voting districts had higher concentrations of disproportionately slim foreigners). Dorling speculated as to why the referendum result had been misrepresented this way, and ultimately suggested that the affluent leave-voting districts in the home counties included the parents of prominent television and newspaper journalists who – being based in cosmopolitan, Remain-voting London – decided to pin the referendum outcome on supposed northern backwaters instead. The speaker also asserted that widespread Eurosceptic sentiment in Britain was a fairly recent phenomenon whipped up by certain self-interested media outlets. He displayed some very complicated graphs to show that the European Union had been a fairly low priority on most voters’ minds for most of the last decade. For the bulk of his speech, Dorling emphasised the difference in political culture between the United Kingdom and the rest of the member states. He stated that, contrary to perceptions of fascism engulfing the continent, it was actually Britain which most supported the far right. Sensing that the audience’s doubt of his bold assertion, he explained that the Conservative MEPs had, in late 2009, broken away from the European People’s Party group to form the European Conservatives & Reformists group, which lay to the political right. In the 2014 election UKIP, which was in the group Europe of Freedom & Democracy, won 26.6% of the British vote and returned 24 members. The Conservatives won 23.1% and 19 members. The British National Party, the English Democrats and Britain First also contested the election, failing to win any seats but collectively garnering about 2% of the vote. From this Professor Dorling concluded that Britain, uniquely among members states, had given the majority of its votes and seats to far right parties. This analysis has some obvious shortcomings – it relies on defining “Far Right” in the most technical and elementary sense rather than the way most observers would understand it – but it does go to show that the political atmosphere in this country is very different to that in those it neighbours. The rest of the talk followed much of the path that one would expect a presentation by a left-wing Europhile to take: Dorling expounded on the unusual level of economic inequality in Britain and suggested that the Leave vote was built on the public’s misdirected anger at social immobility. He noted that the protest vote against immigration was highest in areas with very few immigrants, implying that many Brexiters’ perceptions were based on racist hearsay rather than real experience.He also speculated on the role of education decades back, with references to old textbooks which explained Britain’s history in a manner politically correct for the pre-war era but less than palatable now, suggesting that older voters still harboured under delusions of imperial entitlement. As expected, our speaker took a swipe at private schools and elite universities, saying that they were designed to churn out an empire-ruling establishment. He disparaged the interview system for Oxford and Cambridge on the grounds that they allowed the personal biases of the interviewers to override a candidate’s objective merits. He even postulated that well-qualified applicants were turned down for being too fat. Surely I wasn’t declined on that basis? The talk wound up with a question and answer session. An audience member asked Professor Dorling to predict the next few years in British politics. Dorling suggested that Theresa May would step down before the next general election, with the plausible excuse of failing health, and hand the leadership to someone untainted by the departure process. He also hoped that Jeremy Corbyn would suffer a convenient stroke at some point and be replaced by a younger female (he didn’t much care which) who would then go on to head up a coalition with the Scottish National Party. The microphone came my way for the final question. I asked if the professor thought that the much-decried London-centrism of Britain’s media and journalism had contributed to widescale misperceptions of the country’s demography. He didn’t quite answer my main query, but said it was a tragedy that the Guardian had left Manchester, and recommended that the capital be relocated somewhere near the Birmingham intersection of High Speed 2 so that the existing architecture could be opened up for tourism – an industry which he predicted to boom in the coming years as foreigners took advantage of the inevitable falling of the Pound Sterling. 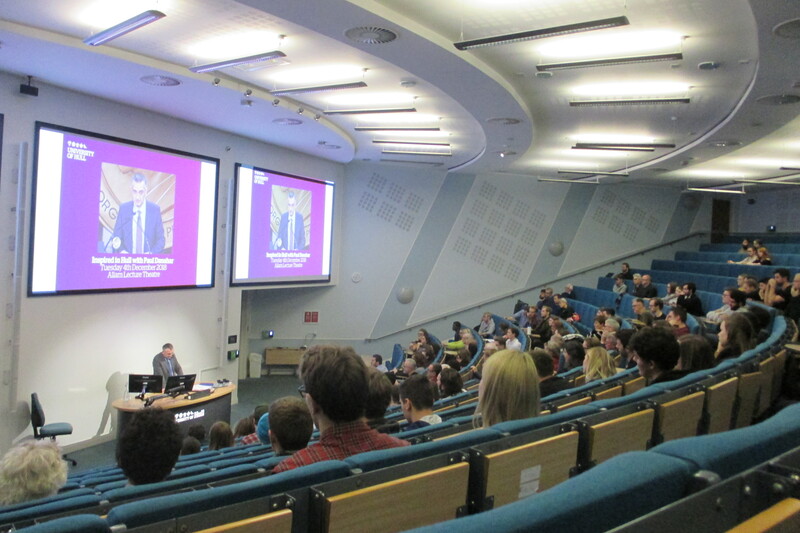 As the month drew to a close, I attended my first forum of the academic year. The format was rather different to that of the sessions I described in earlier posts here. Congregating again on the ground floor of the library, we were arranged not in rows but in squares, with pamphlets and post-it notes. After a short ice-breaking activity in which we introduced ourselves to our immediate neighbours (and then in turn described said neighbours to everyone else), we were shown a slideshow about the details of our roles and asked to have group discussions about how we would carry out our mandate. In particular we were shown an organisation chart explaining the hierarchy of the education zone within the student union. We were also taught about the union money available for campaigns (examples given were campaigns to increase printing credits and reduce paper usage in assignments). There followed a rather confusing exercise – one which President Hall claimed to have copied from a conference she attended some days ago – in which we were given small cards inscribed with examples of things which people at various levels in the hierarchy would be expected to do, and told to arrange them according to how well we thought they were being done. The exercise was confusing because the cards were written in such opaquely bureaucratic language that many of us found them unintelligible. I wish I could recant some examples here, but unfortunately they have proven impossible to commit to memory. 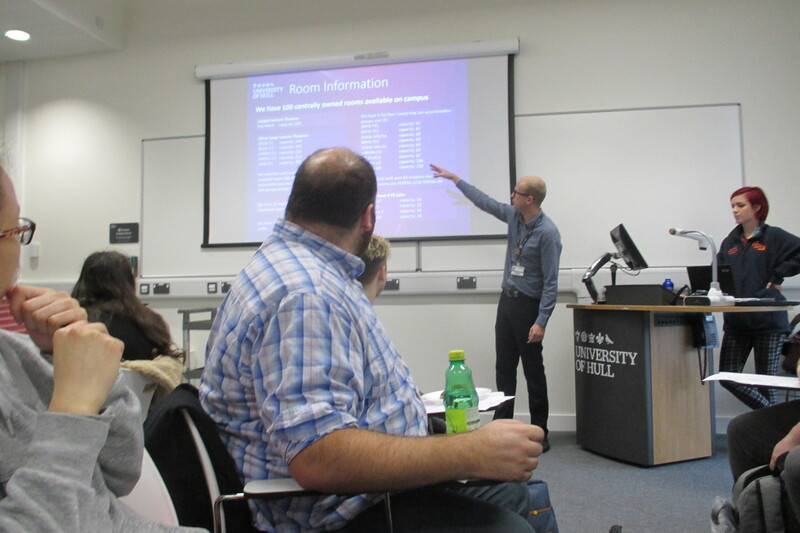 Finally we got to the key theme of this forum, which was – as one might have guessed – timetabling. In a powerfully ironic turn events the registrar, Jeannette Strachan, was not able to appear at the forum in person, so instead we were told to write down our complaints which the president would pass on to her at a private meeting on Friday. The representatives were dispersed and regrouped based on their faculties and told to share their thoughts on the topic. The usual issues arose – online applications not working, websites stalling, rooms being chopped and changed at short notice and even students finding themselves assigned to the wrong course. Our grumbling match was cut short after about ten minutes, though it likely could have lasted several hours. We returned to our original seats for a closing activity – writing down what we were proud to have achieved in our representative capacity so far and what we wanted to accomplish in the future. For some of us this provoked an awkward moment of soul-searching. Today’s forum was a distinctly different experience from those which I had last year. Only time will tell if this represents a mere introductory anomaly or a permanent change. Most of all though, I am pleased to see the return of the refreshment table to the flank of our proceedings. Three kinds of cake! It’s a wonder Norton doesn’t come to these. We were just behind that giant lampshade, honest! 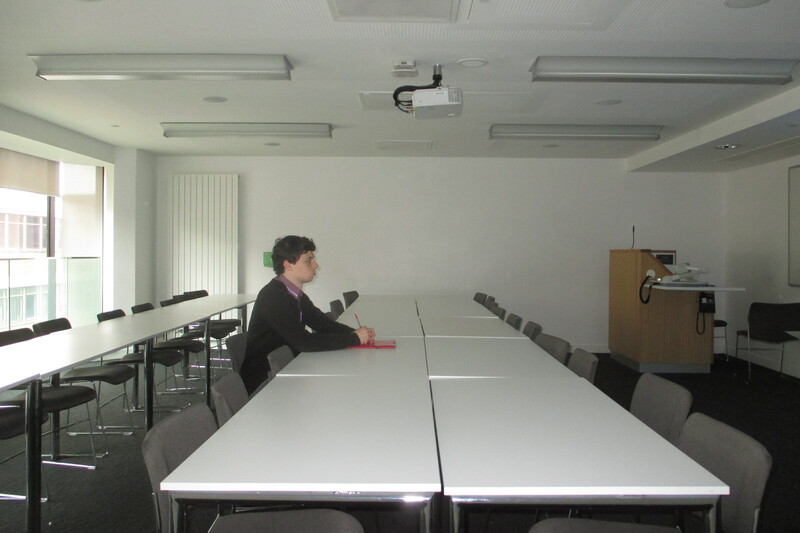 Having attended the larger training session for all of the course representatives, today I went to a smaller meeting, less formal meeting for the subject representatives specifically. We gathered in the ground floor café of the Brynmor Jones Library, having failed to secure a more suitable venue. Our convener was Sanaa Sabir, the faculty representative for Science & Engineering. She talked us through the aims and procedures for the chairing of student-staff forums. As several of us had been school representatives in previous years most of this was familiar to us. We were reminded of the importance of communication between adjacent levels of representatives as well as with the rank and file of the student body. As with last year, it was noted that several subjects – including my own – were missing spokesmen at the lower levels. The first forums have had to be postponed in some cases until the necessary members could be recruited. There was also a discussion about channels of communication, as it was acknowledged that the universities intranets and applications frequently suffer errors. We also knew that many students tended to ignore their university emails. Sabir also told us to look for a major project at whose helm to place ourselves – along the lines of the “plastic pledge”. My biology counterpart, Simon Groeger, suggested a campaign to make the campus bee-friendly. It was reassuring to get back to business at the university, if a little disappointing to do so in such a shambolic fashion. One hopes that a more dignified venue may be secured in time for the forum.